Too fun that i wish Aju is a yearly festival.. I decided to share my Ugbo experience because 2018 is around the corner. I cant seem to forget my first visit to Ugbo and i look forward to visiting again. It was our last year in the higher institution and we were about to write our final exam, few weeks before the exam i found out that one of my friend who is an indigene of Ugbo is celebrating his Aju festival (Iwa Akwa), it was a coming of age festival where young men of the community who has come of age will be initiated into manhood. I was exited about attending the festival because i don’t do that often, when i heard Edu was going to dance in public i just imagined how he was going to do that because he is terrible at dancing, very terrible. As the day went by, the festival day drew closer, three day before the festival day he traveled and two days later, a day before the day of the festival we left Owerri to ugbo in Enugu state. The journey was smooth, the road was free, it was just a three hours journey. When we got to a place called Nenwe junction, we picked a bike to his village, Oyibo Ugbo. Wow! it was something else because the community is situated on top of a hill, its not something i see often because we live in a table land where i come from, but it was a sight to behold, the landscape is breathtaking and the topography is amazing, we finally arrived his village and headed to his house. As we were about entering their compound, the first thing i heard was “unu Ejee oo” meaning you people are welcome. when Edu or as i call him “Uguu” heard our voice, he came and welcomed us, he took us to the sitting room, not too long after we were seated we were presented with a mouth watering dish “Abacha and palm wine” (yummy!). One of the most significant thing about Ugbo people is how they welcome their visitor with Abacha and palm wine, but according to what i heard, its peculiar to all the town and villages in Enugu but i haven’t been to all so i cant be certain. After our dish,we headed to Enugu town to pick somethings up, beautiful city, quiet and calm, good road network very smooth. About 9pm that day, after hanging out in polo shopping mall, we headed back to Oyibo Ugbo, from the town of Owelli court to Oyibo Ugbo, Ugbo youth were seen enjoying, the sound of their ogene music made me want to jump out of the car. hahahaha, i couldn’t help it because it was just so melodious. Finally we landed at Oyibo, the village was still bubbling and the merriment never stopped, i can only imagine what that night meant to them, the happiness can only be equated with the night before a wedding, its something every male child born in ugbo looks forward to. When we got to the house, everybody was so busy cocking, eating, chatting and enjoying. Just when i thought the hill climbing was over, they handed us our food and told us to go to the neighboring town of Mmaku, Edu’s maternal home, its was just a stone throw though, so we drove up to the town and the next day we went back to Oyibo to witness the event that brought us to the town, not after Edu and chidiebere left us and went for morning walk at one of the hills in the town, the hill that hosted one of the Gulder Ultimate search in Enugu, the first ever in Enugu State. The event that day started with the celebrants going house to house with “Oja” mouth flute to alert their members that its time, after their Izo Akwa display at the compounds of their members, they gathered at the village round about where their display started, they did different form of dance according the the tone of the Oja, displaying from the round about down to their village square called Obodo Ike. Finally when they were called to the village square, they entered with full force to show strength and agility, after one of their predecessor brought them in to the village square, he left and they continued with their displace, i was told that without their predecessor, they had no right to enter into the arena. After there group display, they performed individually, this is the time for friends, family and well wishes comes to present gift of wrapper, money, life stock and others to the celebrant while he dances to the tone of the oja. Before the festival ended that day, their successor came to the village square and performed, after which they release some bullet on the air to inform the community and their visitors that they are next in line for the festival, they call it “Inye egbe Akwa”. After the festival ended that day, the next day they performed round the entire Ugbo town, when they heard gun shots, they move simultaneously to the next village to display for them, this they will do till they come back to theirs. The last day of the festival which was the highlight saw the likes of Enugu state Governor, Deputy Senate president, senator Ike Ekweremadu, members house of representatives and other dignitaries from Enugu state and Awgu LGA. All the celebrant from the villages that makes up Ugbo town gathered at the center of the town where they entertained their guest with awesome performance. Each village performed individually before they all performed together to show unity and oneness. The festival also featured Dance from women group, pageantry from maidens of the town to choose the face of Aju festival, wresting and masquerade dance and display. The attire of the celebrants also added glamour, colour and beauty to the occasion. The festival was spectacular, fun, amazing and memorable, my visit was worth it, there was enough to eat and drink, the people of Ugbo are very hospitable, they really know how to take care of their visitors. Aju is a festival you will never want to miss. After the festival, we said “Jama” to oyibo people and ugbo land as we headed back to owerri. 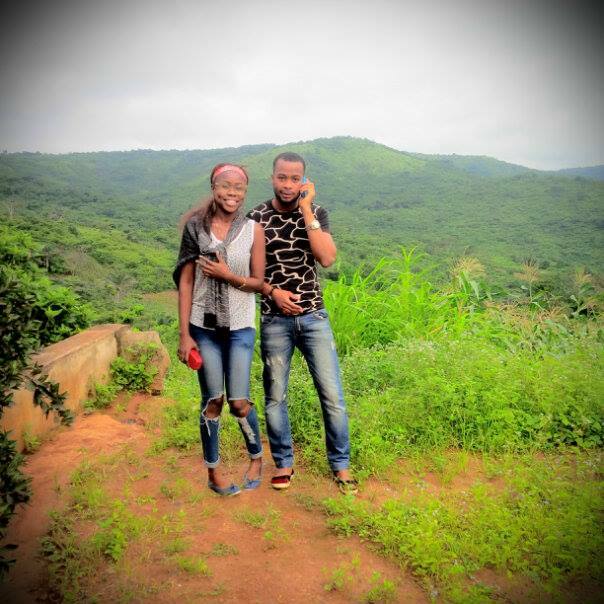 In few words, Ugbo people are really blessed with amazing and breathtaking hills, my visit was just amazing and adventurous. Few dialects i learnt in Ugbo. “Ijee or Unu Ejee” meaning welcome. “Ibokwalu” meaning Good morning. “Njaam gu” meaning thank you. “Idi Ike” meaning weldone. and “Jama” meaning good bye. Oh wow that view from top is amazing, I wanna visit there some day. You are welcome anytime any day. It is… the community would love to host you. Nwane… ibokwalu oo, Ekene dulu chukwu na anyi bu ndu ugbo. anu ogulugu bu anu oma. Such an amazing view, would love to visit someday. Hahahaha Karla….. Ijee nwanyi oma. The community is always open to visitors. your are welcome anytime. the place seems so nice. The view is so lovely! It looks so relaxing. Ugbo is of the Igbo tribe of southeastern Nigeria, precisely in Enugu state. That sounds like a lot of fun. Lovely view. Yeah it was. thank you. The view on top of the hills are so greeny gorgeous! Very relaxing and refreshing. It ia always nice to be with nature. Wow that view is amazing! Looks like yall had a great time! WOW! the sprawling green hills look so lush & beautiful – you get the best pics! Sounds like a really interesting event! Must have been great to witness the traditions! It looks like you had such an incredible time! Love this post!! This place looks really amazing, I would love to visit sometime. Your pictures are stunning and it sounds like you had a wonderful time here. I’ve never heard of this place before but that hillside picture is amazing! I would love to visit if I get the chance in the future. You’re blessed with ability to write fantastic web content, it’s brightens my day, thanks! I always find that I am comforted by travel, especially when it is blessed with open green spaces like Hilltown in Ugbo and its great that you were even to pick up a few local dialectal phrases too. I also have to say that Princess Patter is flawless as well! Oh wow what an amazing place! How lucky you are to have somewhere so picturesque as your hometown! What a beautiful place. Great photography, makes me want to visit. That view is absolutely beautiful. That hill would be such a site. I love experiencing festivals in other peoples villages. This place looks amazing. It’s definitely a one-of-a-kind trip for everyone. The views from the top of a hill are breathtaking. The natures beauty . Really a great place to visit and closer to nature . Love to visit here once for sure ! thanks! Wooow!Woow! That hill looks so magical! I love how green the hill town looks like. And again, I can imagine how great the event was…I’ve always been a big fan of Nigerian attire. What an interesting place to visit. I cannot get over the gorgeous hillside. And I would have loved to hear the ogene music the youth was playing! This place looks great! So much nature, I love it. Now it’s definitely in my bucket list, I hope one day I’ll be able to visit it. A trip to ugbo land obviously will be a fun experience. Nice review. I had never heard of Ugbo before, looks so beautiful. Nigeria looks like an amazing place to visit. What a beautiful place. The green in that photo of the hills is just so vibrant. Stunning. Oh wow!! That view is absolutely incredible! What an amazing and TOTAL Must visit location!